The 20-year-old Thorgan Hazard has a lot to live up to. His older brother Eden Hazard is by many widely regarded as one of the finest players in world football, but there is still more to come from his younger brother Thorgan, who could still prove to be a world beater. After Chelsea completed a move for Eden Hazard from Lille, they immediately reunited him with his younger brother Thorgan. There are many differences between the two brothers, even though they play in very similar positions. Eden is well known from his time at Lille for being in the right place at the right time. He would score goals from all over the pitch from his wing role. Thorgan, though, is more of a creative player than his brother. Thorgan spent the majority of his youth career with Lens, where he developed his abilities to create play from the midfield; unlike his older brother who preferred to be in front of goal. Since joining Chelsea, the player had been immediately sent on loan to his homeland, Belgium, to join Zulte. The Belgian side have done remarkably well in the 2012-2013 Jupiler League, no doubt thanks to Thorgan's efforts. At Zulte he went on to score 3 goals in 29 games. As a youngster, Thorgan began his career playing as a defensive midfielder. It was not until he turned 17 that his coaches realised that Thorgan would be much more comfortable operating in a more forward role. 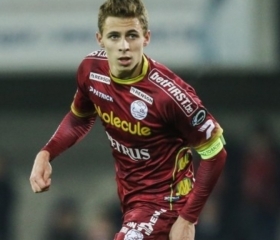 At Lens, Thorgan only played 14 games for the club before he would be allowed to leave and join Chelsea. The fee remains undisclosed, but reports suggest that the Blues may have paid as much as 3 million Euros to lock down the transfer. In 2013, Thorgan finally was able to play his first game for the Belgium national team, much to the delight of his older brother Eden; who has tipped Thorgan for greatness. What makes Thorgan an exceptional talent is his ability to create play from anywhere in midfield. He enjoys playing the game with the ball at his feet, creating chances for other players as opposed to getting forward and scoring the goals like his older brother has become famous for. Thorgan's passing technique has developed well in Belgium this year, no doubt down to his regular first team football. It is not yet known whether or not Thorgan is in the first team plans at Chelsea, but he is expected to spend at least one more year away on loan from the Blues.